Perfecto is a secondary brand of "lancer fronted" leather motorcycle jackets designed by Irving Schott and manufactured by American clothing company Schott NYC. 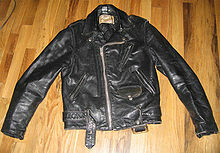 The first jacket was introduced in 1928, making it the first such styled leather motorcycle jacket. They were worn by such icons as Marlon Brando in the 1953 seminal movie The Wild One, by punk rock pioneers The Ramones in the 1970s and styled by fashion designers such as Jean Paul Gaultier in the 1980s. 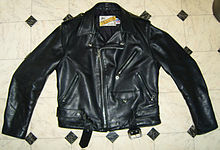 Schott Bros later manufactured a very similar jacket for the Beck label, which he was previously a representative, called the Beck 333 Northeaster and in the late 1940s, Schott Bros introduced a new jacket based on the original Perfecto design called the 613. It was soon nicknamed the "One Star" because it had a star on each shoulder epaulette. These jackets have a snug, almost tailored fit, which is suited for motorcycle riding but are short by today's standards. The 613 and 618 Perfectos have been produced for more than 50 years, so finding out when a vintage jacket was made can be difficult. There have, however, been slight variations in the design over time. Some of the details in the timeline below overlap. The 613 One Star is introduced. Jackets are made out of horsehide. Neck label is rectangular, black with Perfecto App U.S Pat ??? Genuine Horsehide Front Quarter - Style Quality printed in gold letters. TALON main and cuff zippers and 'Miter' belt buckle (rectangular with mitered corners). Side pockets are at an approx. 60° angle and breast pocket at a 50° angle, zippers close up. Jackets have snaps for attaching fur collar, no snaps on collar, plain snaps, sleeves are double stitched, epaulettes are also double stitched and have a rounded end. Stitching on collar is placed further in than it is on lapels. Lining is black with grid stitching. Straight lower back panel and underside of sleeves are one piece. Inner lower facing and sleeve plackets are made out of faux leather/vinyl. The 618 is introduced. It is identical to the 613 except for the lack of stars. In The Wild One, the stars on the epaulettes and the snaps on the collar of Marlon Brando's jacket were not original, but added to the jacket. Its popularity and connection to The Wild One movie led to it being banned from sale in many districts of the England and USA and becoming a symbol of rebellious youth. Jackets are made out of steerhide. Neck label is black with Style Quality Perfecto Genuine Steerhide All Hand Cut in creme and red letters on coat of arms/crest. Small long white size tag with black letters directly below neck label. Schott Bros. Inc. printed on leather neck hanger. Stitching on collar and lapels is placed at the same distance from edge. Passants have one seam and a pointy end. ESKO cuff zippers. Side pockets are at an approx. 55° angle and breast pocket at a 65° angle. Neck label is black with bull and cactus, Perfecto genuine steerhide - handcut Schott Bros. Small white size tag with red letters directly below neck label. Neck label is square, black with Schott in white curly letters above orange and yellow coat of arms (Griffin and unicorn on the sides of it and an S in the middle). Size tag still on lower edge, white with red numbers. Jackets are made out of steerhide (613/618) and naked cowhide (118, introduced in 1977). Neck label is rectangular, creme white with bull in upper left corner, Perfecto in yellow diagonal stripe and by Schott Bros. in lower right corner. Small white size tag with red letters directly to the right of neck label. TALON cuff zippers. Side pockets are at an approx. 55° angle and breast pocket at a 60° angle. Schott NYC appears on neck label, small white size tag with black letters directly to the right of neck label, tag with American flag and Made in U.S.A directly to the right of neck label (under small white size tag). Nothing printed on leather neck hanger. Schott (YKK) main zipper, EMAR cuff zippers and rectangular belt buckle with oval sides. Pocket zippers now close down. Lining goes all the way down inside of jackets, leather sleeve plackets. A slight dip in bottom part of lower back panel, otherwise straight. Schott stops producing the 613 One Star. Underarm footballs, two piece underside sleeves, oval lower back panel, inside pocket and snaps on collar are introduced. Snaps for attaching fur collar are removed (no fur collar produced). Snaps have Schott stamped on them. Motorcycle rider instead of bull appears on neck label, size is printed on the American flag tag. Leather inner lower facing. Side pockets are at an approx. 60° angle and breast pocket at a 50° angle (reverse from what they were in the 1960s-70's and more like they were in the 1950s), side pockets are moved further away from the center of the jackets and down a bit. Square thin buckle is introduced. Schott reintroduces the 613 One Star (in steerhide with mid 70's neck label) but without snaps for the fur collar and with inner pocket. Snaps on 613 are plain. Snaps for fur collar back on 618/118. Style 118 is updated to a fuller fit, 613/618 retain original slim fit. Schott NYC chrome main zipper, IDEAL sleeve zippers and bigger square belt buckle (by Century Canada) are introduced. Side pockets are at an approx. 60° angle and breast pocket at a 45° angle. Style 118 is fitted with new chrome pocket zippers with different pulls (Schott recently switched back to the original chain zipper pulls) and a snap under the belt buckle to prevent it from damaging the gas tank. The side pockets on the 118 have supposedly been moved closer to the center of the jacket for easier access. Inside map pocket moved to the lower right and a leather trimmed inside breast pocket added on the left. The 613/618 have not been updated since the early 1990s. Panzer wrap, a short black leather jacket issued to Wehrmacht tank crews that fastened with buttons rather than a zip. Reefer jacket, a hip length double breasted leather coat issued to pilots, German U-Boat officers, and Red Army commissars during the Great Patriotic War. This page was last edited on 1 February 2019, at 19:11 (UTC).